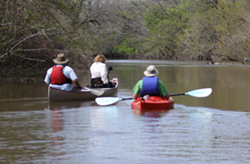 The Limestone Bluffs Paddling Trail covers about 5.3 miles of quiet water on the Navasota River from the Confederate Reunion Grounds to Fort Parker State Park. The route is characterized by hardwood bottomlands and limestone bluffs, and wildlife such as waterfowl, beavers and white-tailed deer are commonly seen. From Highway 84, west of Mexia, take F.M. 2705 to the south for 3.3 miles, the Confederate Reunion Grounds will be on your right. From Highway 14, north of Groesbeck, turn left, west, on F.M. 2705 drive 2.3 miles west, the Confederate Reunion Grounds will be on your left. Take Hwy 14 north from Groesbeck 4.9 miles turn left on Park Road 28, from Mexia travel 6.5 miles south on state highway 14 and turn right onto Park Road 28. There is an entry fee at each site - $4 per person at Fort Parker State Park and $2 per person at the Confederate Reunion Grounds S.H.S. Shuttles from Fort Parker State Park up to Confederate Reunion Grounds S.H.S. can be arranged for a small fee to facilitate your trip on the river and lake. Please note:The River Boat Launch Park offers an alternate access point. This section of the river supports numerous Largemouth Bass, Crappie, and White Bass. Small lures such as jigs, plastic worms, spinner baits and light-line are recommended. 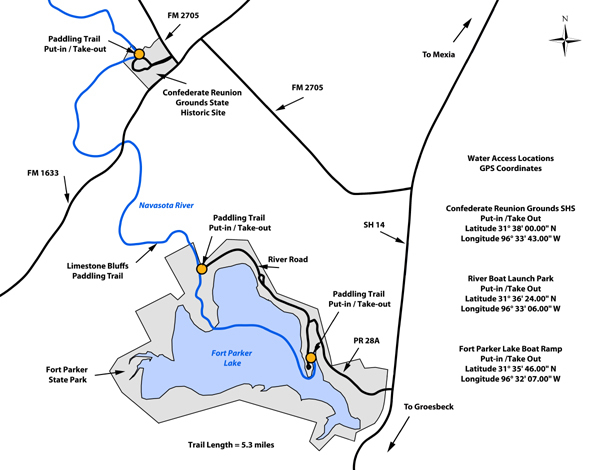 Heavier line and equipment are recommended for the Channel Catfish and Blue Catfish in Fort Parker Lake. The riparian corridor of the Navasota River supports a great diversity of plant and animal life along the river and beyond the banks. Birds spotted here include the Great Blue Heron, Wood Duck, Belted Kingfisher, egrets, Eastern Bluebird, and Red-tailed Hawk. Pecan, American Elm, Winged Elm, Black Willow, Bur Oak, Water Oak, and Osage Orange trees grow along the river. Common wildlife encountered include deer, turtles, beaver and squirrels. It is not unusual to see livestock watering in the river. A replica of the old fort brings alive the history of the some of the first pioneer settlers to Texas. In 1836 the fort was attacked by Indians. Cynthia Ann Parker was captured, raised as a Comanche Indian and became the mother of Quanah Parker, the Comanche Chief. Old Fort Parker is open Wednesday through Sunday, 9 a.m. to 5 p.m. Lodging & camping available daily. Phone: 254-729-5253. Special Events include Christmas at the Fort, Trail Rides at Old Fort Parker, Spring Trail Ride, Fall Trail Ride and Thanksgiving Trail Ride. This historic site commemorates a place where Civil War veterans gathered from 1889 to 1946. Today, in the spirit of this site’s history, it remains a gathering place for living history events, family reunions and group activities. The site features an 1893 pavilion, a civil-war era cannon and the Navasota River. The site is open daily 8 a.m.–5 p.m.
A beautiful park with camping, picnicking, hike and bike trails, river and lake access, and air conditioned group facilities. The park features fresh water springs, the town site of Springfield, and Civilian Conservation Corps architectural features. The park is open daily, reservations are recommended for campers on weekends and holidays. Downtown Groesbeck is full of unique shops to browse for that perfect shopping trip. Get away from city life for a weekend of history, nature, good food and fun. We have two Bed & Breakfasts and two hotels to make your stay great. The historic Limestone County Courthouse and the Limestone County Museum are also located here. The spring brings some exciting events such as the Southwest Fiddle Championships and the Lions Club Car Show, both held in Groesbeck City Park every May, as well as the Limestone County Fair. This trail was made possible through a partnership with the City of Groesbeck, Texas Historical Commission and Texas Parks and Wildlife Department. Transport of rental canoes can be arranged from Fort Parker to the Confederate Reunion Grounds at 10:00 a.m. daily. Fort Parker State Park cannot transport people.